Come enjoy our space! Both of our yoga rooms are beautiful open spaces filled with natural light and can be rented hourly or in blocks of time when available for events, appointments, meetings, etc. Studio B is right around 325 sq ft and can be utilized for small groups most days, evenings, and weekends (unavailable Monday and Wednesday evenings). 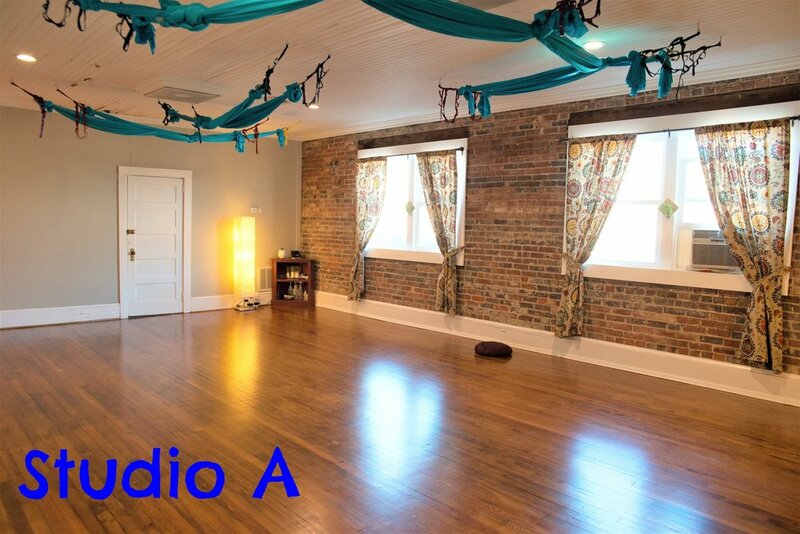 Studio A is the larger of the two main rooms at about 540sq ft, with exposed brick and unfinished accents. This is our main practice room but is often available for weekend rentals. Studio A is connected to our lounge with a sitting area, small refrigerator, microwave, and sink. Two restrooms are available for use on our floor. Please fill out the form with your event information to inquire about our rental rates or to receive a quote.